This ancient port city is an intersect of sea, mountain, urban, and rural landscapes. Named for the laurel, the fresh evergreen used by Romans to adorn the heads of important citizens, Lovran is as diverse as it is beautiful. From the beautiful Adriatic Sea, to Mt. Ucka rising as backdrop to the city, to its narrow streets lined with ancient, 3-story buildings, to the pastoral rural areas just outside the city, it is a fascinating mix of old, new, urban, rural, mountain, and sea. That attraction was not lost on the Roman noblemen. Marcus Agripa built his summer home on the townsite back in the 1st century. Known for the Marunada festival celebrating Lovran's harvest of sweet chestnuts, Lovran also celebrates Carnival. Zvoncari dancers sporting sheepskins and ramshorns encourage the arrival of spring, while driving out the villain of troubles known as Pust. 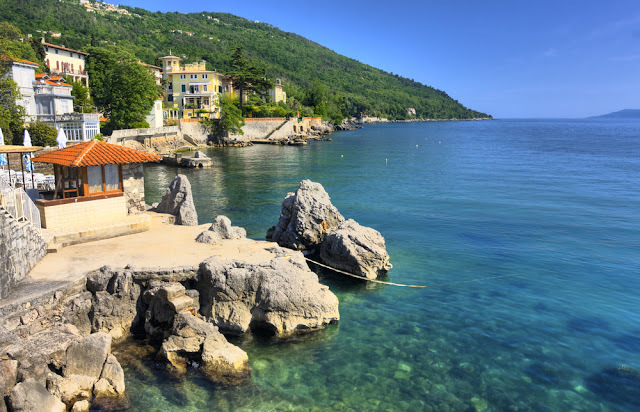 Lovran also plans festivities around the asparagus harvest in April and an abundance of cherries in July. Autokamp Medveja: Great camp; 3-star; Medveja bb, Lovran www.remisens.com/hr/autokamp-medveja. See ART Google Map for additional recommendations on places to see and things to do in Lovran: http://www.adriaticroadtrip.com/p/adriatic-road-trip.html. Explore other destinations in Croatia: http://www.adriaticroadtrip.com/p/cit.html.